Remember how we were happy that the Royals were coming to town? The Cleveland Indians head into a much-needed day off on Thursday having lost five of their last six games to close out the month of May. 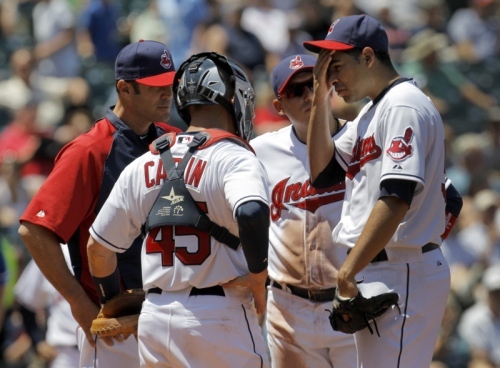 During that streak, the Tribe’s starting rotation has worked 28 innings and given up 37 earned runs. That’s an ERA of 11.89. Travis Hafner is on the disabled list and is scheduled for arthroscopic surgery on his right knee on Thursday and will most likely miss at least four to six weeks … Jack Hannahan is on the disabled list … Carlos Santana is still out with concussion symptoms … Rafael Perez was moved to the 60-day disabled list over the weekend … Acta will skip Ubaldo Jimenez’ turn in the rotation on Saturday so he can make his next start on the road against Detroit, even though Jimenez has a road ERA of 9.00 this year (compared to 3.38 at home) … anything we missed? At least the last-place Twins are coming to town this weekend. That has to be a good thing, right? So the Cavaliers will be picking fourth in the upcoming NBA Draft after the New Orleans Hornets ended up the big winners in Wednesday night’s draft lottery. The Cavs won’t be getting Kentucky’s Anthony Davis, but if they do there homework there is no reason they can’t land a good player. A member of the University of Michigan’s 2013 football recruiting class, who set on a fire a recruiting letter he received from Ohio State, has received death threats from Ohio State fans. Brown is beautiful, especially paired with Orange.